Handcrafted and proudly Indian, Studio Moya celebrates age-old crafts traditions, but not without its own dramatic spin. 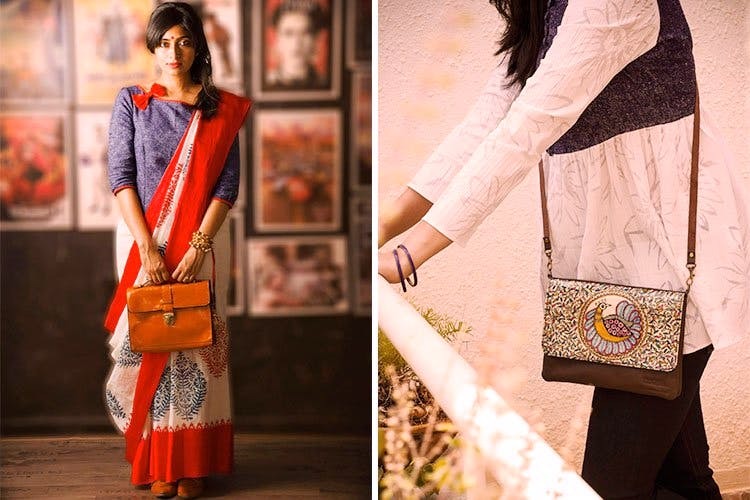 The result is a stunning collection of Laal Paad saris, Madhubani lamps and bags in myriad avatars. Moya realised how precious indigenous crafts are, and sadly in a world that values cookie-cutter everything, they were fast disappearing. So in a bid to reinvent these techniques and give the craftsmen a way to keep them alive, they went far and wide, collaborating with artisans who were still living a life of oblivion, working with traditional tools and techniques. The brand reaches out to them by letting them work in a happy, familiar environment, creating a consumer base for these handmade beauties. Thanks to this tie-up, us city folks have access to these amazing saris, pen stands, chandeliers, dupattas, bags, tablet sleeves and passport covers. We’re told that at Moya, every product you pick has a story of a craftsman and his/her journey. Sweet, right? Everyone who takes pride in the country’s impeccable craftsmanship will love Studio Moya, for there are never too many art fairs to attend and never too many hipster clothes and bags in your indie wardrobe.